Free "Mini" catalog. 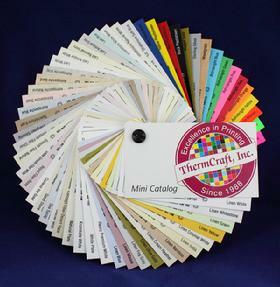 Our new "Mini" catalog displays all of the papers we offer. It even has a few extra papers that you won't find in our regular catalog. You get the actual look and feel of each paper. It is also full of sample layouts for you to choose. As you flip through the pages, you will see the different ink colors available and how they look on different colored stock. We even have samples of our foiling to look at. The "Mini" catalog combined with our website gives you all you need to create an order. The best part of our new "Mini" catalog is that it is free. Go to the "Contact Us" page or click on the link to request your free "Mini" catalog.